Non-Destructive Testing (NDT) Services Market size is set to exceed USD 4.5 billion by 2025; according to a new research report by Global Market Insights, Inc.
Due to the high costs associated with the repair & maintenance and the limited construction of new infrastructure, the existing infrastructure is experiencing high usage, leading to increased stress & deterioration of the existing infrastructure. These dynamic costs are encouraging infrastructure owners to focus on repairs, maintenance, and upgrade more quickly. For instance, the rising demand for refined petroleum products coupled with high plant utilization rates will drive refineries to upgrade their facilities to enable efficient operations and increase the production capacity. In order to sustain the high utilization rates, companies are adopting NDT services to ensure the safety & integrity of assets. The owners & operators of infrastructure assets have to face a number of stringent government regulations and safety requirements. Failure to comply with these guidelines and standards can result in significant financial liabilities, increased scrutiny by the regulatory bodies, tarnished corporate brand value, and higher insurance premiums. The increasing number of industrial accidents, including explosions and fires, over the last decade has caused significant damages to the reputation of many companies. As a result, the infrastructural owners & operators are using NDT services to help them comply with the safety regulations. The visual inspection segment accounted for over 20% NDT services market revenue in 2018, as the technique is easy to implement and usually eliminates the need for any further types to testing. These methods have proven to be inexpensive alternatives to volumetric & surface inspection methodologies. Some of the industry verticals, which use visual testing methodology include structural steel, automotive, petrochemical, aerospace, and power generation. The lack of skilled inspectors and inadequate training infrastructure have restricted its acceptance among various sectors. The radiography market is expected to attain a growth rate of over 5% during the forecast timespan. The rise in the number of infrastructural developments and the introduction of stringent regulations for the maintenance of various critical infrastructures have created myriad of opportunities for the growth of the radiography NDT services market. The technology is used in the automotive and aerospace manufacturing industries to manufacture high-tolerance components while reducing wastage. The time-consuming nature, high implementation cost of the technology, lack of trained professionals, and risks associated with the radiation exposure are restricting its adoption in certain industry verticals. The aerospace NDT services market is expected to register a growth rate of over 6% during the forecast time period. NDT services provide effective & economical solutions for high-volume & low-cost production of various aerospace components. They are used for monitoring and testing safety-critical components without affecting their structural integrity. The services provide a highly-effective way to detect minuscule imperfections or damage in components or materials throughout their operational lifecycle. They are used to detect geometrical irregularities such as material thickness, bond line & wielding defects, delamination, porosity, foreign objects, cracks, and corrosion. 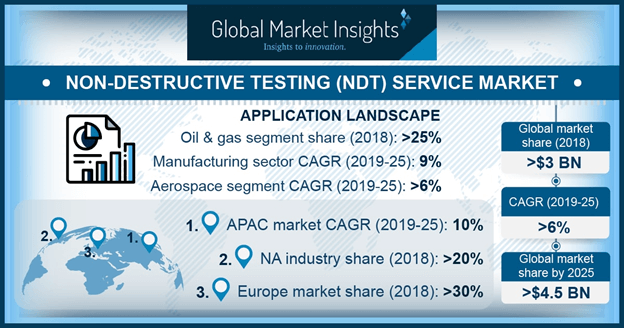 Europe region held over 30% industry share in the NDT services market in 2018 due to the presence of several players such as Intertek, SGS, and Bureau Veritas in the region. The players are conducting various collaborative efforts to expand their geographical reach across various high potential markets. The European Union along with the local government has introduced various stringent guidelines mandating the use of NDT services to ensure employee & product safety. The region’s aerospace industry is currently in the growth phase with clearance of a huge backlog of existing aircraft orders. The aircraft giants, such as Boeing and Airbus, have a record backlog of over 12,000 new aircraft to be manufactured by 2025, generating numerous growth opportunities for the NDT service industry in the region. The major players in the NDT services market are adopting inorganic growth strategies to increase their market share and gain an edge over their competitors. They are integrating the services offered by regional players to enhance their product portfolio to solidify their position in the market. They are concentrating on enhancing their presence across several end-markets in key geographies such as South America, Asia Pacific, and the U.S. For instance, in January 2019, ALS acquired MARSS International, a South America-based NDT service provider, to strengthen its distributional network. This acquisition will provide ALS access to crucial port locations of strategic importance to enhance its service to customers across various end-markets.